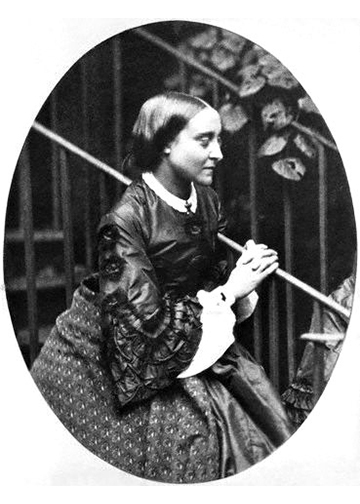 Christina Rossetti was born into a family of Italian exiles in London on December 5th 1830. 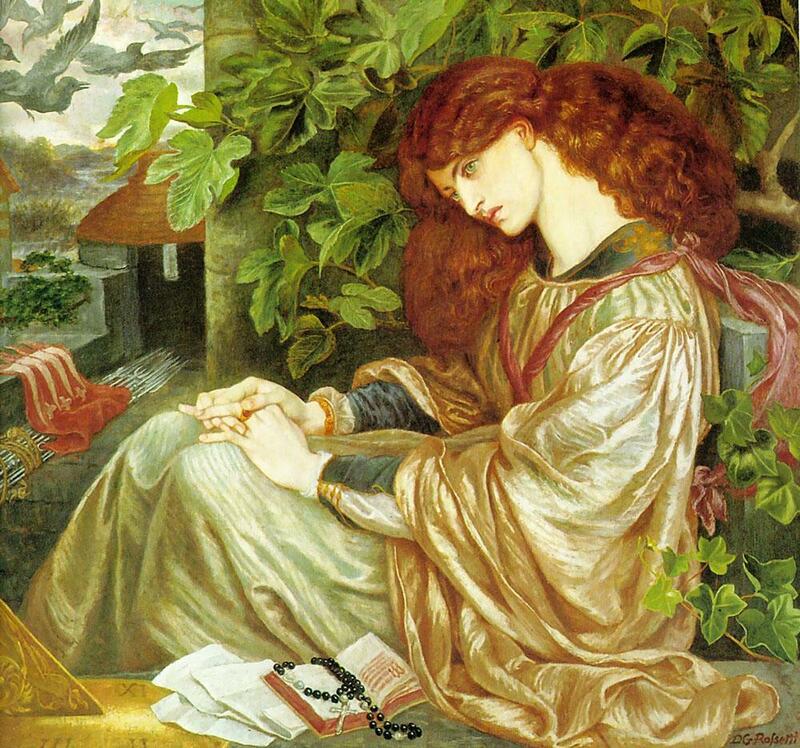 She was sister to the influential Pre-Raphaelite painter, Dante Gabriel Rossetti. In the Victorian era, Christina Rossetti’s beautiful language and imagery was very much respected, but her work quickly fell out of fashion in the wake of the 20th Century’s Modernist movements, which stripped away ornamentation and subjected everything to thorough Freudian analysis. Under such scrutiny, much of Rossetti’s work was labelled as pedantic and sexually repressed. Yet, in the late 20th Century, Rossetti’s works were picked up once again for serious criticism and she is now considered an ideal example of the restrained female genius: an angel in a corset. This particular poem, In Progress, is a succinct but potent meditation on a woman who has lost her beauty and her vibrance to the drudgery of fulfilling society’s expectations. It is not clear what this woman has sacrificed her essence for, but the reader imagines that she inhabits the role of an unfulfilled but dutiful wife. Or maybe, In Progress, is about what it is like to be a gifted Italian poetess, blessed with visions of an Earthly Paradise, but trapped living in a society so restraining to the human spirit. No matter what the scenario is actually about, In Progress, pierces the reader with that grief that can only be experienced when you feel that life has beaten you down into submission. 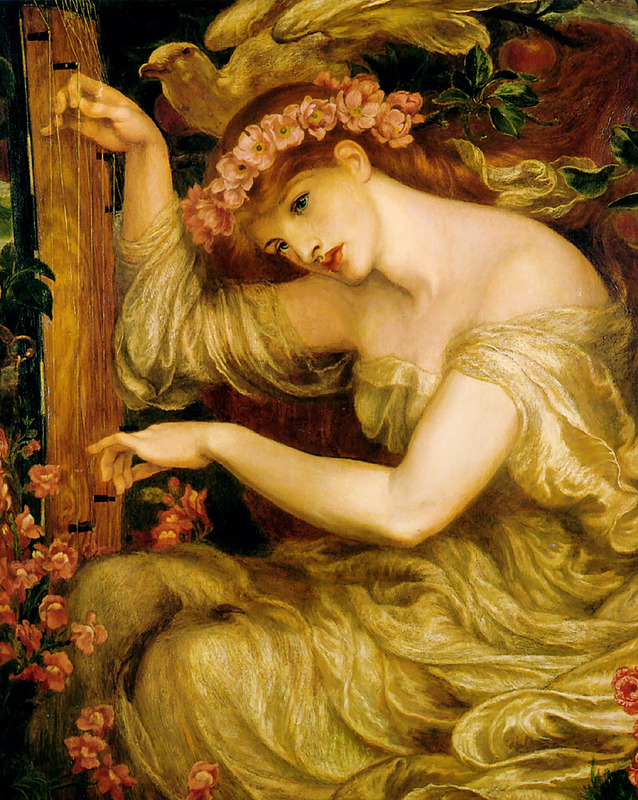 But Rossetti’s muse was not lost in complete despair. The poet has a vision of the woman’s true angelic form: a ray of light for all to be uplifted by. This week, the Sun will enter into the sign of Virgo, which will shift the solar light’s focus from Leo’s self-importance to Virgo’s selfless devotion. This transition from sovereign to servant is always a bit disconcerting and a certain amount of ennui usually sets in before we adjust. Leo emphasizes fun and self-discovery, so any shift away from that is always a bit of a let down. Remember how it feels to have to go back to school after summer break? That’s the kind of sadness that arises when Leo fades into Virgo. 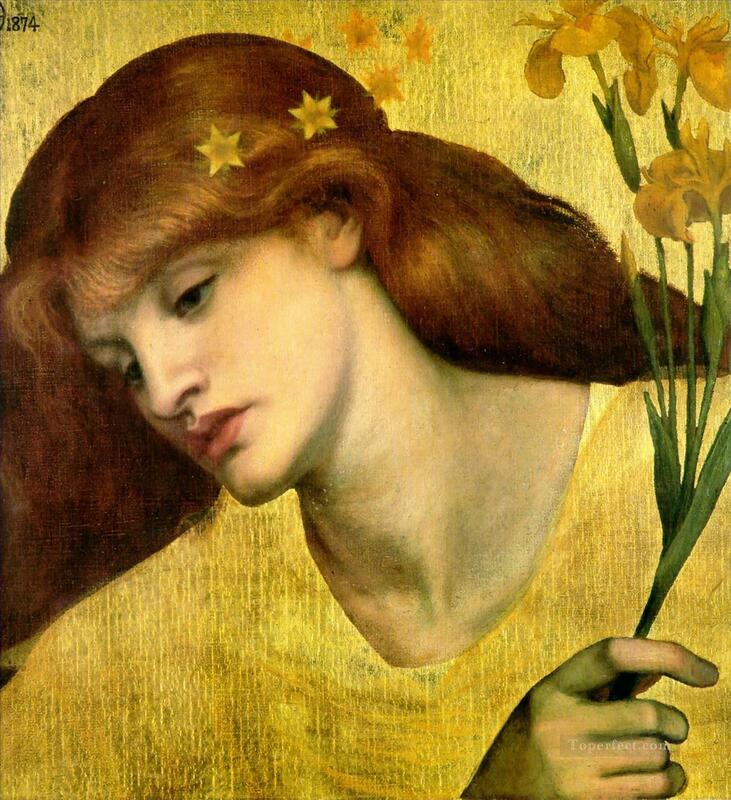 Consider Rossetti’s, In Progress, to be a perfect poetic description of Virgo at her most masochistic. As we can observe in a priestess or an artisan, Virgo is meant to inspire sincere devotion and intelligent attention. But, the servant who has been exploited loses her noble purpose and eventually fades into ineptitude. This week will be tinted with feelings much like those in Rossetti’s poem. There may be a distinctly melancholy tone, yet it will be punctuated by an effervescent faith in your own eventual transcendence. The downtrodden servant must rediscover their divine intention. Also this week, with Mars and Saturn conjunct in Sagittarius, feelings of restraint and frustration might amplify an ongoing internal conflict. Like sparks flying off of grinding metal, when Mars and Saturn fuse their oppositional energies, life brings many heavy labors. The only way to handle these labors is to relax into the burden, focus on the necessary tasks, and rise to meet the challenge. It is essential that you remember to preserve your energies as much as you expend them. Monday, the Sun moves into the sign of Virgo. With four planets (Sun, Mercury, Venus, Jupiter) in this sign, expect a chaste sense of propriety to insinuate itself into your life. Virgo, the Virgin, is too often conflated with Victorian concepts of sexual purity which are the most myopic understanding of this ancient symbol. Consider that a Virgin in the ancient world was not an untouched child, but was a priestess of the Earth goddess in her multitudinous forms. Virgins had a special role to fulfill in maintaining the sacred and vital relationship with the Earth itself. Thus, these Virgin priestesses were not necessarily celibate, but were in fact free to remain unmarried. The cartoonish descriptions of Virgo’s prudishness and pickiness are a mere caricature of a misconception about what Virgo, the Virgin actually is. Virgo is a priestess of the highest order. In her rightful place, she is a servant of humanity by way of her devotion to the sensate intelligence of the Earth itself. You may know this intelligence by many names including: Gaia, Sophia, or Pachamama. In Virgo’s stately position at the mouth of the Earth’s chthonic caves, she is blessed with the role of guardian to all organic life which she embodies through her artful perceptions of emergent phenomena and her precise instincts which effortlessly align with divine order. It is no great surprise that in the wasteland of the global corporatism, that Virgo is one of the most misunderstood signs in the zodiac. In today’s world, the the wisdom of the Earth is rarely heard and the Virgin’s role is practically non-existent. Virgo is lost in the modern world of nuclear fallout and genetically modified crops. Thus, a perfectly modern Virgo is most often seen as nervous, neurotic and hypercritical. This is because the Earth is sick and Virgo’s many gifts as a priestess of divine order are woefully ill-used in modern bureaucracy. When unable to find a noble position of proper service to humanity, Virgo often becomes an exploitable pencil pusher. The initial days of Virgo’s season are usually beset with wild vacillations between rebelliousness and common sense. Thus you may honestly intend to begin organizing your life and preparing for intense work, but you may fail to maintain any semblance of focus. At the beginning of the week, Mercury and Jupiter are also conjunct in Virgo giving you a remarkably wide scope of intellect and imagination! This is a moment in time where you may stand amazed by the ideas you have, yet somehow will feel unable to implement any of them. Write them down and work out the logistics on paper, but wait for a better moment to take action. The conjunction between Mars and Saturn will reveal to you just how many labors go into maintaining daily life. The feeling of hardship that will befall you must be handled with the utmost patience and decorum. It is common to react to such a feeling of heaviness and burden with tension, followed by a wild outburst of fury. Thus, you may want to steer clear of people who have less than desirable emotional control during this transit. Mars and Saturn challenge you to temper your emotions and your energies with a smooth flow of concerted effort and deliberate relaxation. Once a proper channel for this broiling energy has been found, an immense amount of productive work can be accomplished. No matter how monotonous it may seem, chopping wood and carrying water are still amongst the greatest lessons in life. By Friday, the Mars/Saturn conjunction begins to lose some its traction. However, just as Mars pulls away from its exact conjunction with Saturn, it makes an exact square with Neptune in Pisces. This represents a moment where you will be tempted to suddenly veer off into a strange direction. You may construct paranoid beliefs and get lost in overamplified fears. It is best to avoid the typical reaction to such feelings and resist the urge to comfort yourself with heavy intoxication. With a Mars/Neptune square, allowing yourself to get too drunk or lost in fantasy is likely to end up humbling you considerably. You may lose complete control of your judgment and your willpower if you give in to the dark side of your imagination. Therefore, to reduce the possibility of damage, you might want to use this night to write, paint, draw, or dance, staying clear of obviously dangerous situations and people. Good things come to those who wait. Saturday and Sunday will bring some angelic gentleness to soothe the burn of this burdensome week. The Moon will be in the mothering sign of Cancer, and Venus will be conjunct Jupiter in Virgo (also conjunct Mercury). Finally, the heaviness lifts and some beneficent happiness and harmony returns. When Venus, (love and luxury) conjunct Jupiter (expansion and luck) many beautiful experiences are yours to be had. Expect to feel elated, the supreme embodiment of optimism and generosity. Your many graces will be easily recognized and thus any relationships that you invest time in during this transit will respond with a rosy glow of joy. Any opportunities that appear this weekend are likely to be truly magnificent. You will walk in beauty and repose under this influence: your angelic light fully revealed.